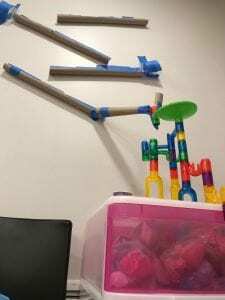 You have to try different materials to make a rube goldberg project. For our first step we used lots of cardboard to make pipes on the wall. We taped this on the wall with blue tape. Our second step we used a marble and a marble run. Our third step we used a rail with a cardboard stop around it. We also used dominos, magnet tiles, a green and white ping pong ball, a soft green ball, two green blocks and another magnet tile. For our fourth step we used a string, cardboard, a long squier and blocks. For our fifth step we used tin gold fairytale books. For our sixth step we used two boxes, a chair, Mickey Mouse tape, a lego car, a rubber duck and a long orange rail. Our seventh step we used two cardboard pipes and more Mickey Mouse tape. Our last step we used a tennis ball, a red block, Mickey Mouse tape, a fidget spinner and a Mickey Mouse balloon. We used mostly cardboard because we had a lot of that around the house. Most of the material were already in Alexa’s basement. The only thing we really bought was the Mickey Mouse tape and the Mickey mouse balloon. 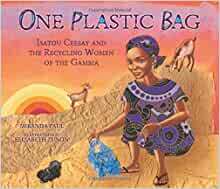 The materials we used were mostly reusable. We did not plan the materials we were gonna use. We tried different materials for our different steps.we kept on changing the materials and at one point in worked. A Rube Goldberg project takes lots of time and tries to make it work. We tried many, many, many times. Sometimes we had to change are whole plan! Such as we started off with using a car to set off the Tower of Terror, but that was too heavy to be pushed off the string. 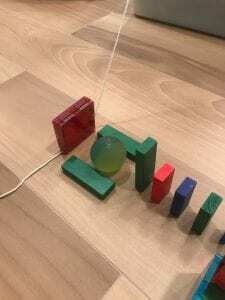 We tried 2 green blocks on the side with a green soft ball in the middle of the 2 blocks, and we put a magnitile in front of the ball to hold the string until it fell over. This plan worked! 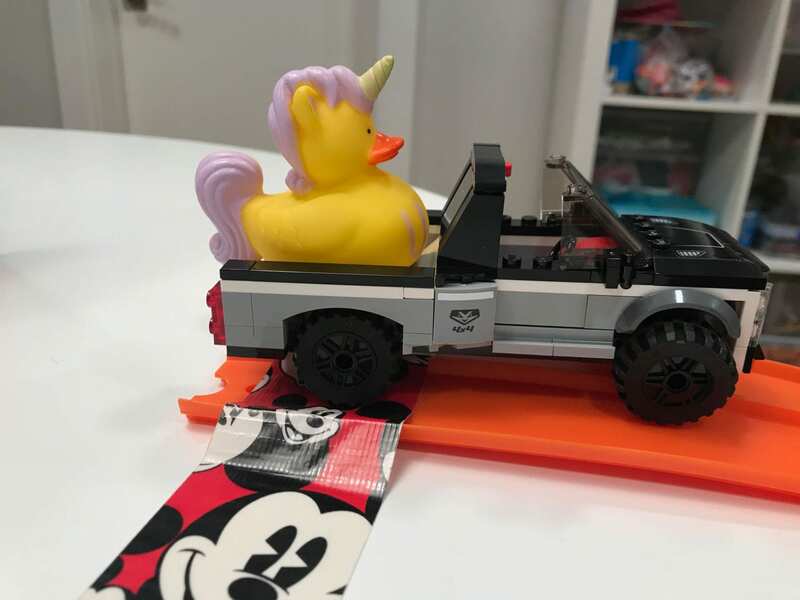 Another plan was that we changed the idea of using water and instead, we put a rail on the chair and then got a lego car and stuck a rubber ducky on top of in and let it go down to hit a tennis ball which then hit a fidget spinner to release the balloon with Mickey Mouse on it. We tried our Rube Goldberg many times and each time it stopped working somewhere else. 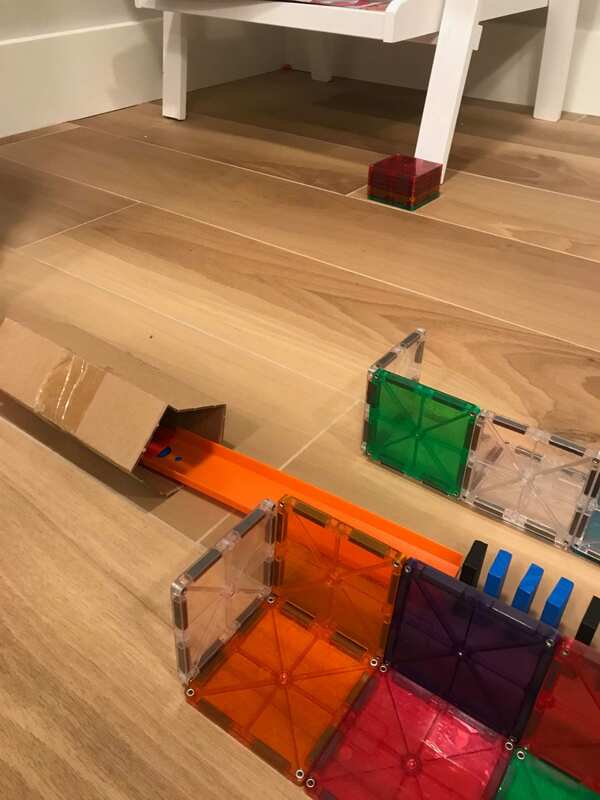 Such as the marble would get stuck on the cardboard pipe tape or it would get stuck in the middle of the marble run. After every try we had to take a good look at our project and change something to make it work better. At our 25th try it finally worked! We were so happy it did not get stuck and it did not stop – it all worked! We were cheering and screaming so loud! The moms who were filming were so happy, they forgot to film the end!! WE then had to do it all over one more time to get it all on video. During design process we had many good ideas, but not all of those ideas worked out when we started building. 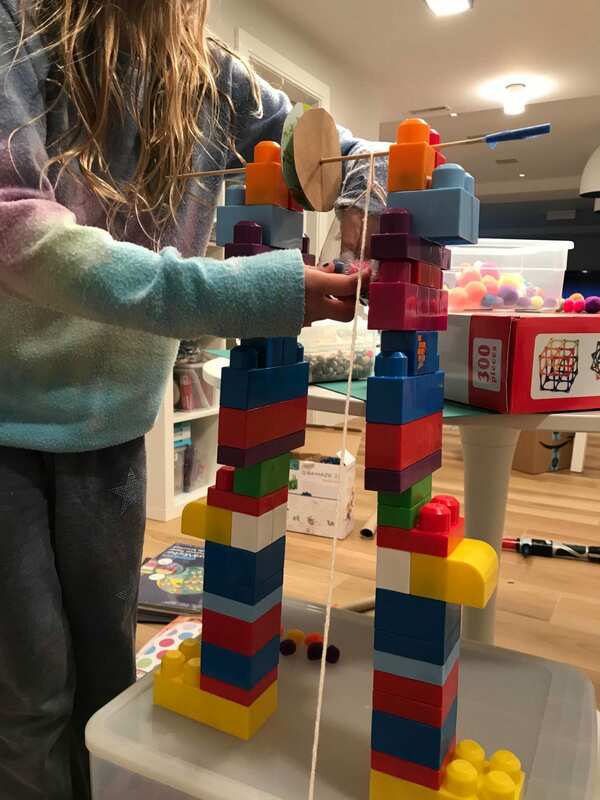 One example is when we build the pulley (the tower of terror) .When the weight in the bucket was to heavy the dominos could not hold down the string. If the pulley weight was to light it will not make the books (fairytale forest) fall over. We had to try many different things, in the bucket and a ball attached instead of a bucket. We are still not happy with how it is going to we are working on this more this week. We also had the idea to use fidget spinners and we were thinking maybe 3 of them next to each other but when we tried it wasn’t that easy. This is another thing we will work on this week. Making the sketch was a sort of easy part, but putting all the steps together and making it work together was really hard. We also wanted it in a theme and it should look nice. That was not easy. this is the photo of our pulley. As you can see there are no books up yet this photo was taken before that idea came to mind. We also changed the bucket (half a water bottle) to a tennis ball. This is my 3rd blog post for my rube goldberg project, and I am going to talk about our sketch. When we first started we had some ideas but our final sketch is very different then our first ideas. In my last post I talked about the design up to the pulley. When we thought light about what would come after that, we sketched a book forest, set off by a see saw and a water part with a unicorn rubber ducky. Making the sketch and making it work in real life are very different. We found out that the see saw part wasn’t really working that well and the books would fall without the sea saw part, as long as the first book was positioned in the right way on the cardboard levy. We didn’t update our sketch as the big ideas did not change but the details did. At this moment we are going to work at the hardest part where a water bottle will fall over and fill a bucket with water and hopefully the ducky will fall out to set the next step to go. That will be a ball that needs to make the fidget spinners move. I think it will be hard to get the waterfall in the right spot (without getting everything wet) and for the bottle not to drop in the bucket. 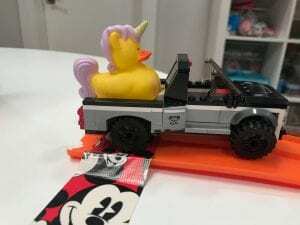 Getting the ducky out will also be hard. We might need to build a tunnel or something to make it fall in the right spot to set off the next step. Or maybe we need to use a ping pong ball instead, but the name is Donald Duck pond so that would not be good. We will leave the sketch as it is. We decorated it and it is ready to go to school. And perfect for all our classmates to see. When I first heard of the Rube Goldberg project I was really excited. My first blog is about the many decisions we had to make. Who to work with? What theme to pick and where to do the project? I chose to do this project with my friends, Alexa and Maya. We made this decision at school when we first heard about this project. We talked about it at school but when we needed to get together it was hard to find a time that was good for all of us. Because of this Maya decided to do the project by herself. This was not an easy decision for anyone to make. Whe then had to pick a place to work. We have decided to to work at Alexas house because she has all the tools and the space so we did not have to move the project. Her basement has many building supplies and she has a lot of cardboard which can help with the project. We can build the project in a place where we don’t have to take it down for a while. For our project theme we picked Disney. We picked Disney because we thought it would be cool to make all of the rides and use the Disney theme. We thought that we would make our project take place in the different Kingdoms. 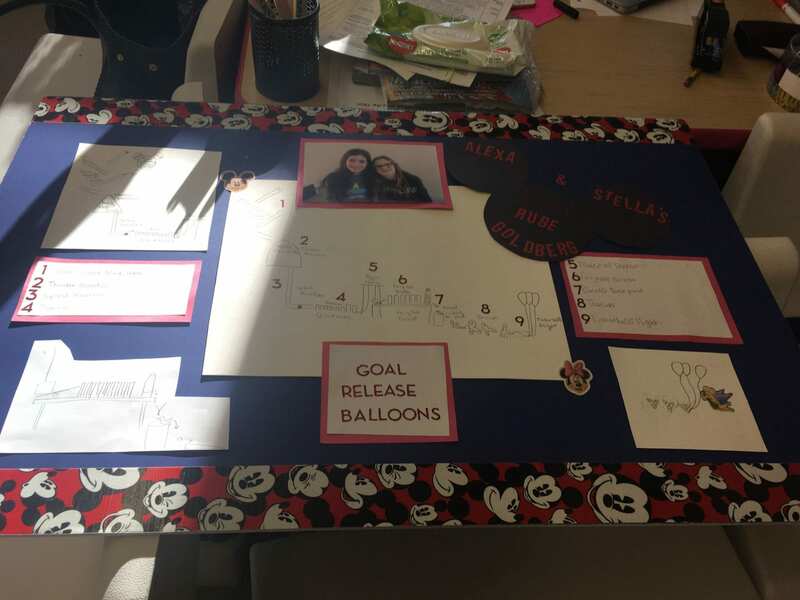 We decided our goal of the Rube Goldberg was to let a balloon with tinkerbell or mary poppins go up in the air. After my research I started to sketch my ideas. We agreed to both think and draw out 2 steps and get together on Saturday to work them out. My idea was to start at the wall and have a marble go down into a mountain like structure. I will tell you about the building in my next blog.